Fill a barrel with lava rock and use that as your filter for your pond. Your water will stay cleaner longer. I use Barley hay, you can buy it in bundles of all sorts of shapes and sizes. It floats at first which is great for the frogs to float on. Then it settles to bottom but continues to clean algae. It is said that barley hay was used in the old days for keeping algae controlled in water cisterns and wells. I have a pond that measures about 30' across and is about 5' deep in the very center, and I want to keep algae from forming without having to treat the water with chemicals, or clutter the pond with plants to block out the sunlight. I have seen ponds that are larger than mine and they have no plants and they are in direct sunlight and the water looks clean. Will it help if I have certain types of stones like lime and sandstone in the pond? What would happen if I used salt water rather than regular city water to fill the pond? Please help! First off, I applaud your intention to control algae without chemicals. It is not necessarily the easiest or most convenient fix, but most chemical solutions are only a temporary cure for the problem anyway. There are several ways to keep algae under control in your pond without using chemicals. The key is finding which combinations of biological and physical components work best to keep your pond in balance. It may also take some time and patience to figure that out. It is not clear to me from your question whether your pond is stocked with fish, so disregard any of the following strategies that do not apply to your situation. Assist your plants in keeping your pond clean. Use a vacuum to siphon the bottom of the pond regularly. Remove dead leaves and fallen debris with a skimmer or rake as quickly as possible. Plant submergible aquatics. They take up nutrients in the water and release oxygen during the day to sustain fish and other aquatic life. They also remove excess nutrients from the water, which discourages algae growth. A rule of thumb is to plant one bunch of submerged plants per 1 square foot of surface area. Add a barley straw bundle (1 bundle per 1000 gallons of water). As it breaks down, barley releases an enzyme that acts like an organic algaecide. Bundles need sunlight to decompose, so if you try this strategy, don't let the bundles sink to the bottom of the pond. Attach a cork or a plastic soda bottle to the bundle to keep it afloat. After 2-3 weeks, the bale will decompose and provide effective algae for control for up to 3-4 months. Consider adding a biological filter and beneficial nitrifying bacteria (like Microbe-Lift or Bio-Pond) to your pond. These bacteria feed on the same nutrients as algae and will help keep algae bloom under control. Algae thrive in full sunlight. Adding enough floating plants (like water lilies, water lettuce and water hyacinth) to cover 1/3 of the surface of your pond will help provide shade. Use a pump to aerate water and keep it moving-especially near the side of the pond. Koi eat algae, but they also create waste. Limit fish to one inch of fish for every square foot of water surface in your pond. Also, don't be afraid to approach and compliment the successful pond owners you see. They'll probably be more than happy to share their secrets with you. Barley straw in your pond will inhibit algae growth. I have a small fountain with a prefilter; and the "spitter" part of the fountain--an ornamental frog--has a small UV light inside that the water passes by, and it kills any algae without chemicals. I had the same problem finally I had to get a filter, (a large 55 gallon drum with pvc pipes in it with holes. You can go on line and look up how to make one. It works good but you also have to provide shade for your pond. I just got rid of my pond because my back just couldn't take the cleaning anymore. At one time I had over 100 fish a mix of kaoi and gold fish. Also remember that gold fish give off ammonia and that is a toxin if it builds up. Good luck with your pond. Plants will soak up all those nutrients floating in the water that the algae also use to grow. The more plants you have the less nutrients in the water and no algae. 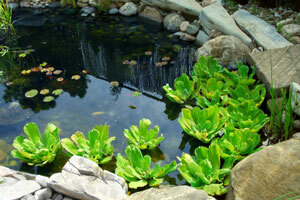 I use an algae control product in my pond that is very natural and easy to apply. It is environmentally friendly, safe on fish, pets, humans and plants. You can even swim in the pond. Have them give you a free quote. I'm sure it will not cost much considering it is a very small pond! I used copper sulfate for algae control in my pond. I ended up killing all my koi. Is there any way to get the copper to dissipate or do I need to drain my pond to reintroduce koi? I recently moved into a house in rural SE PA. There is a rather large pond that has a lot of green algae floating on the top and what I would call a seaweed growing up from the bottom. The pond is about 70 - 80 ft long and about 15 ft across with an average depth of 4-5 feet. I have tried barley straw bales that have been in about two weeks, I tried the use of an algaecide, but so far no positive results. I really would like to clear it asap as it sits in my 1.2 acre yard and what should be a beautiful focal point is currently an eyesore. Any help would be greatly appreciated. Is there a recipe for vinegar to use in backyard ponds with fish? The pond has algae on top. I want to kill the algae without killing fish. The algae is taking the oxygen away from the fish. Please help. Clean as much out as you can and then take an onion bag and fill it with straw.This should keep the algae away. I don't know about the vinegar it might kill the fish. I wouldn't use vinegar without checking with a reliable source. 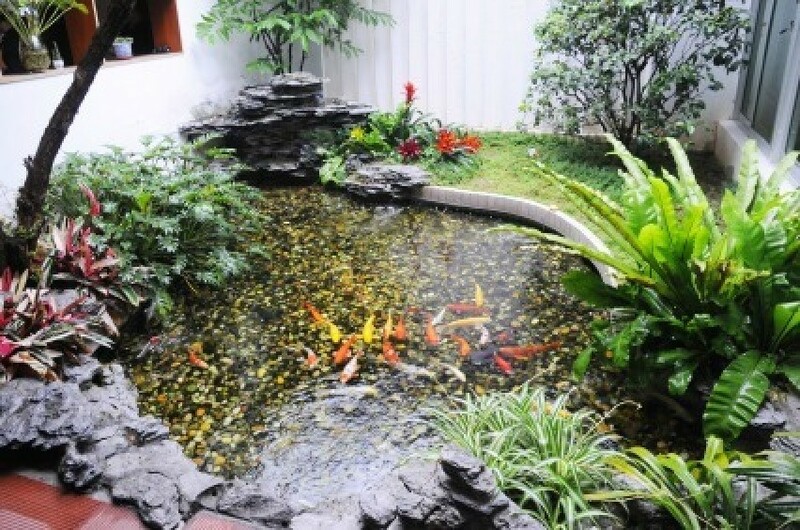 I had a fish pond for years with no problem. Do you have any plants in the pond? Water hyacinths are supposed to help. In the house, I have algae eaters in the aquarium. I've seen products for sale called barley straw balls, which is supposed to deter the formation of the algae, so I would think you could try wheat or oat straw, if that's more readily available to you, but you should try to give it some sort of floating assistance, like tie on a sealed empty plastic bottle. BTW, vinegar will change the pH of the water and could easily kill your fish. I use a product called AlgaeFix. It is safe for fish & plants, I have aprroximately 25 fish in my pond & lots of plants & have never had an issues. It works very well. Question: Can Salt Control Algae in Fish Pond? I have a 7000 gallon fish pond with more than 70 Koi fish. I am faced with the problem of algae, and it is spreading very quickly. The walls of the fishpond are marble. One man advised me to put salt into the fish pond to control the algae. Is that true? Algaecide for fish ponds is very difficult to buy, and could not be found. How can I control the algae without damage to the fish? Koi are very expensive fish. Don't do anything or add anything without first checking with a koi expert. If it's an outside pond it's getting to much sun you must have as much as the top water covered with plants to cut the sun light. If you have plants and you use a algae killing chemical it will kill the plants trust me. Salt will help if your fish are sick we had to do it once but it must not be be the regular table salt. I have read that putting sterile carp in a fish pond will take care of algae. I dont think i would use salt tho. I put two in my pond I have on the farm where I live and it worked. No more algae. Go to a farm supply store and order one. I think one should do it. Hope this helps. It's certainly a good idea to know how to get rid of the algae in your pond, but nothing beats designing for a good healthy ecosystem with the right combination of plants! Koi are tough on plants, but there are ways to protect the plants so they can take up the nutrients and compete with the algae. ...A pond without fish is like...well...the air without birds! I have been using an algae control system product that I found to work VERY well. It is safe fish and you can even swim while using the treatment. I would check out this site for more information! Does an Oase 6000 pump work OK on the bottom of a pond 27 inches deep? How can we balance our goldfish pond water with household products? We are thinking of products like baking soda, vinegar, muriatic acid, etc. We have a 6 foot x 27 foot pond. It is 1.5 feet deep at the shallow area with a 3 foot deep area. We have few water plants and full sun light. There is a homemade 30 gal. sand and gravel filter with a 3 foot to 4 foot long steam. From what we have read we have blooming algae (green water). I moved into a new home and there is a 50 gallon pond in the front yard by front door! It has green algae along the walls. I bought a $50 filter and pump at Lowe's and it doesn't do the job. I have bought stuff to put in the water which also does not seem to help. I went to a pond nursery and ended up buying a PF 300 filter and am going to try to hook it up with the little pump I got at Lowe's. This filter cost me $150. The pond is oval and has 2 shelves on either side with a deep center. I feel I am going round in circles to keep clean. Or do I have to! I have no fish as of yet, just one plant, (variegated Japanese iris). Do I need a filter of this magnitude or should I keep pouring in the chemicals (algae killers)? I found this info on ehow.com. Hope it helps some....sounds interesting about the water lillies. Algae control is an essential part of maintaining an outdoor fish pond, an environment commonly used to house koi. Because they are outside, these ponds are constantly exposed to sunlight and stray organic nutrients, both of which promote algal growth. One type of algae that's particularly annoying is green algae, which is composed of tiny, microscopic phytoplanktons that give the water an ugly, green tint. There are many chemical solutions sold in stores to help eliminate this problem, commonly called algaecides, but they can be potentially harmful to your fish if used improperly. Luckily, there's another, much easier and natural way to both eliminate and prevent green algae. Using the hose, siphon about one-third of the water from your pond. Refill the pond, making sure that the fresh water is about the same temperature of the water already in the pond. Add the appropriate amount of dechlorinator. This amount should be specified on the product's packaging and is dependent on the amount of water you replaced. Scatter water lilies across your pond until they cover about two-thrids of the surface. They will shield much light from reaching the water and also absorb many nutrients the algae would otherwise use to grow and spread. The green algae should gradually vanish within about two weeks. Another reason for algae prevalence in ponds is due to rainwater carrying nutrients into the pond, which feeds the algae and allows it to propagate. To help prevent this occurrence, simply use a shovel and build a narrow trough around the perimeter of the pond. This will catch rainwater, preventing it from washing into your pond. Be wary when using any of the dozens of chemicals available for eliminating algae. These products, if used improperly, can be hazardous to your fish. They also typically cause the algae to die very rapidly, which can cause a sudden depletion of oxygen, not to mention causing the bottom of your pond to be covered with a layer of dead algae. Thus, it's safer to simply allow the algae to dissipate naturally. Putting some barley straw in a flow through bag will help keep the pond clean. It will not clean the pond, but if you put it in there after you clean it, it will help keep it clean. I"m not talking about using a huge amount, just a small handful in a bag should do the trick. I read about this on the Gardener's supply website. My pond holds approx. 2000 lt. It has algae growing on the plants and fish in the pond. How can I safely get rid of the algae? What is blanket weed and how do I get rid of it? Is there anything other than bleach or pool chemicals that I can use in my small garden pond to prevent algae? Last year I used laundry bleach and it killed a frog. I have also caught dogs in the pond on hot days. I don't want anything that will be harmful to animals, etc. I've had to drain and clean the pond twice already this season due to the algae and it's too much work to keep doing it repeatedly. 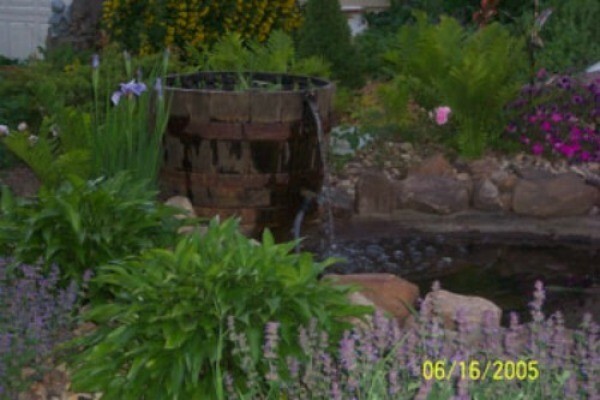 There is a water fountain in the pond that runs from 6 a.m. to 9 p.m.
My mother and grandmother used barley straw to keep their ponds sparkling clear/clean. They both had fishponds that were havens for fish, frogs, birds. I have a small pond. I would like to know what is best to put at the bottom. At the moment I have a few stones, the water is running clear, but all of the stones are green. Please give me any tips to get them clean. Thanks. That green you see is algae. It's necessary in your pond, any pond that is in good condition will have it. It's the natural flow of things. It's probably the reason your water is clear. Any flat surface in your pond should be covered with 1-2 inches of small rocks. That prevents dirt/debris from being stirred up from the bottom. If you don't want the green, then you want a swimming pool. If the water is clear that is great. I have never seen any pond or water feature without any green. I say just let it be. Will a weak solution of muriatic acid harm fish in a pond? Question: How to Clean Green Ponds? My pond is heavy green. How do I clean it having 2 filters in it? How to get rid of pond green water? How do you keep sand in a fish pond clean, so that it doesn't turn green? If I use Shock for a pool and chlorine to reduce the algae, would it be safe to use these items in my water pond if I do not plan on adding fish or plants for a month? I'm in Zone 8. But when my grandmother's pond covered over with green slimy gunk, we went to the feed store and purchased something that was specific for a pond that would not harm the fish. I can not remember what it was, but the feed store is your best bet, or your county extension agent can help direct you. Eek! The residue would definitely be a harm to the plants and fish. That kind of chemical harshness isn't necessary. There are products that you can buy at your local gardening store that won't harm the fish, or try your local pet store. This isn't harmful to either plants or fish. Thanks everyone! I am trying some stuff that is a bacteria, the good kind and is supposed to help. I also have a barley bail, but it was said that this will be more helpful as time goes on. Although my pond is still green, I was told it is safe enough for fish and plants. These two elements plus the bacteria supplemental are supposed to help balance everything out naturally. Apparently my pond looks worse than it is probably due to the rain we had and now it is hot and sunny. The bloom happened rather quickly, and I hope it goes away soon.